It is not uncommon that some true aspirants who are leading a sincere spiritual life do get some siddhis. A few readers of my Blog have sent queries about ‘siddhis’. They want to know whether it is eventually good to possess these siddhis, if they come unasked. Or, are siddhis positively harmful? What is Siddhi? In plain Sanskrit it means ‘success’. Siddhi also means ‘perfection’. In spiritual world, ‘siddhi’ connotes mystical Powers. Saint Tulsidas, in his famous ‘Hanuman Chalisa’, praises Sri Hanuman as the ‘giver of eight kinds of ‘siddhi’ (mystical Powers) and nine kinds of ‘nidhi’ (wealth)’. What are they? One authoritative source to know about siddhis is definitely Rishi Patanjali’s Yogasutras. Swami Vivekananda’s lucid exposition of these sutras is indeed popular throughout the world. anima, mahima, laghima, garima, prapti, prakamya, istava and vasitva. These are the eight powers that one gains by a control one acquires over the elements. Anima is the power by which one becomes very small. Mahima is the power by which one becomes very big. Laghima is the power by which one becomes very light. Garima is the power by which one becomes very heavy. Prapti is the power by which one can contact anything anywhere, whatever be the distance of that object. Prakamya is the capacity to fulfil any wish that is in the mind. Isatva is the capacity to bring anyone under one’s subjection. And vasitva is the mastery over the whole universe. These are the powers, says Rishi Patanjali, that one can get by ‘samyama’ (absolute concentration) on the five elements. In his famous lecture on The Vedanta in all its Phases, delivered in Calcutta, Swamiji says: All powers and all purity and all greatness — everything is in the soul. The Yogi would tell you that the Siddhis – Animâ, Laghimâ, and so on — that he wants to attain to are not to be attained, in the proper sense of the word, but are already there in the soul; the work is to make them manifest. Patanjali, for instance, would tell you that even in the lowest worm that crawls under your feet, all the eightfold Yogi’s powers are already existing. The difference has been made by the body. As soon as it gets a better body, the powers will become manifest, but they are there. Are these Siddhis really helpful in one’s spiritual life? Yes, they are indeed helpful provided – the Powers are used for the good of others and if Guru’s permission to use them is obtained. Nevertheless, Siddhis have captured the minds of aspirants from ancient time and by following any or in combination of all the four yogas namely, Raja Yoga, Jnana Yoga, Bhakti Yoga and Karma Yoga, the siddhis can be obtained. One illustrative story that we find in Mahabharata is about an ascetic who meditates in a forest. Once he was doing his sadhana when a bird’s droppings fell on his shaven head. Utterly disturbed and consequently irritated, he cursed that the bird be burnt to death. And lo! The bird immediately fell from the tree dead. The ascetic understood that he has already developed a siddhi and became proud of it. When the time came for taking alms, he ventured into a nearby village. It is an ancient practice in India that the renunciates stand in front of homes and call loudly the mother of the house to give them the required alms. A few minutes passed and there was no response from that home. Again he knocked at the door and called a little more loudly. Still there was no response. The third time he called with disgust and became angry. He was aware that he had got ‘siddhi’ the mystical power and hence thought would use that same power that he had used in the morning in a forest. At that juncture, a sweet voice of the house lady came through the still closed-door. She in a warning note, replied from inside, “Look! My boy! Don’t ever think that I am that bird which you burnt it to death! Hold on! I am coming now!”. Obviously the ascetic was dumb founded as the morning incident of his burning a bird in that forest was not known to any one. How could this house lady who was in a distant village knew what happened earlier. Now, more than alms, he was curious to know about her. She opened the door and welcomed him in her home. While giving this ascetic boy the meals, she explained the cause for the delay in her response. She showed him how her ailing husband was in the bed and he needed all services that she lovingly rendered to him. The knowledge of knowing about this ascetic was part of gaining a siddhi. She further informed him that such mystical powers could be obtained not only by meditation but also by performing one’s duties with love, respect and dedication. 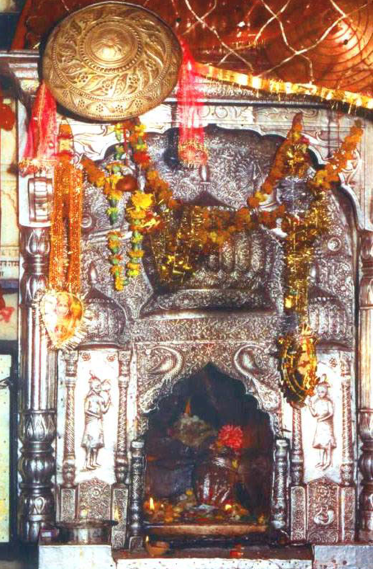 30 kms south of Kangra valley in the lap of Shivalik range and 56 kms from Dharamshala, the Jwalamukhi temple is dedicated to the "GODDESS OF LIGHT". One of its own kinds of temples, there is no idol in it. An eternally burning and shining blue flame emanating from a rock sanctum is only worshipped here as a manifestation of the goddess. Dedicated to the deity of Flaming Mouth or goddess Jwalamukhi, the temple is one of the 51 power spots or Shaktipeethas of India. One of the most revered temples of the Hindus, the temple possesses a golden dome, gifted by Mughal Emperor Akbar. The temple is at its best during Navratri festival in early April and mid October. Once during my three-month ‘wanderings’ in North India, I reached Jwalamukhi, a place of pilgrimage in Himachal Pradesh where Divine Mother is worshipped in flames of fire. It was about evening. Getting down from the bus, I sauntered in that small sleepy town searching for one night accommodation. I saw a guest house run by Gita Bhavan. The receptionist gladly welcomed me and gave a key and two blankets. He showed me a spot in the verandah of the upper floor where there was a cupboard in which I could keep my bag and even lock it. I spread the blanket on the clean floor. Locking the cupboard, I went down to take bath before proceeding to mandir for darshan. I found several common bathrooms and toilets in the corner of the buildings. There was a huge well. A small bucket has been tied with a rope. By throwing the small bucket in the well, one can easily draw water and pour it in a bigger bucket and use it for bath and other purposes. While I was taking the small one in my hands, readying to place it in the well by sending it down, someone came to me and forcibly took the ropes in his hand, saying sweetly, “Baba! Please don’t! I am here to serve you! I shall fill this bucket with water and place it in a bath room. Please wait!”. I thought why at all I should take the help of another person when drawing water from a well was not a difficult task. I looked at the person who offered help to me. He was a middle-aged man, robust in health and having a turban on his head signifying that he belonged to the Sikh faith. So quickly that the Sardarji drew water I had to accept his seva willy-nilly as I was getting late for the evening arati in the temple and had no time to argue with him. Once the temple arati was over, I returned to Gita Bhavan. That Sardarji was still there near the well and I was surprised to see him, drawing water from the well for everyone else too. One after another the pilgrims were served by him. I do not know how many buckets of water he must have filled in serving all those who came there! When he became free, he slowly came to me and sat with me to converse. After the initial exchange of pleasantries, he told that he was very happy to meet me. I too expressed my happiness for his unasked seva. He strangely told me was I not coming down from the Himalayas? Did I not stay with a highly evolved monk for a few weeks? Did I not learn such and such things from him? To say the least I was indeed surprised. I thought how he could exactly point out even what I had studied under a monk and where I was in past weeks. Naturally I enquired with a tinge of suspicion, how did he know about me. In a most disarming way, the Sardarji replied that once he saw any one, he could instantly come to know of all personal details about that person. What was striking about him was his utter humility. In sweet intonation, he described how he had undertaken the seva to pilgrims in that holy town several years before. He had a small shop for his income to take care of his family. Once the shop hours were over, he spends his time at this guesthouse where hundreds of pilgrims come and go. He continued further to say that it was his privilege to serve them in a spirit of Karma Yoga! Each is great in his own place? All spiritual aspirants are familiar with karma Yoga. Karma Yoga is a plan of action for betterment. It provides certain values in our life. It makes us pure by stripping off our selfish motives. It has such wonderful practices that make us work for others in a spirit of service. Self-sacrifice becomes inherent and it elevates the individual who is attuned to it. In short Karma Yoga contributes for the making of a man to an elevated spiritual being. One of the doctrines of Karma Yoga is activity. Performance of action must be according to one’s own nature and occupation. Whatever be the social status, whether a person is a monk or householder, the duties that has befallen on his status must be carried out. Next Post: Shubha Sri Rama Navami! The experience of ‘Karmayoga’, as related by you, is wonderful !! Your article comes as a divine blessing for us from Maa Durga on this sacred Chaitra-Shukla-Pratipad tithi, marking the start of holy Navaratri. Thank you so much for the Blog and interesting articles and spiritual advice so much needed by us. Siddhis are one of the many milestones the devotee sees on his/her pilgrimage to The Unmanifested One. As a devotee/’traveller’ if one stops at any milestone to enjoy the ‘scenery’ at that point, the devotee will not reach the Goal/Destination of his/her journey. Thakur tells us that we have come to eat the mangoes at the orchard, so one should not get caught up in counting the tree, leaves and types of mangoes. Eat the mangoes and reurn Home. That’s a wonderful insight you gave me into the teaching of Sri Ramakrishna. May be this is what Robert Frost meant by “Many a miles before I sleep”! Prostrations at the lotus feet of beloved Swamiji! What a glorious article, how true it is that we all possess these powers. I myself find certain ‘siddhis’ come alive in me when fasting for ‘sravan’. At times I have the ability to foresee something that is about to happen, and when it does, it seems like ‘dejavu’. but these powers are shortlived as I need to be more disciplined in my spiritual sadhana. The article about the householder serving the monk is familiiar to me, as I recall reading it in one of Gurudev’s articles. It is true that no form of work we do is higher than the other, all actions should be selfless seva to the Lord! Yet time and again our ego gets in the way! In our ashram Swamiji used to give the Doctors the work of cleaning the toilets, to cut the ego, and if an event went well and we developed egos, Swamiji would immedeiately set us straight! The Bhagvat Gita is a shining example of all forms of action, and their importance. It is true that even Sri Ram could not sway the ocean when he needed to cross it to get to Sri Lanka, and although we may question that there is nothing that Sri Ram could not accomplish, even the law of righteousness still prevailed, that a bridge had to be built. 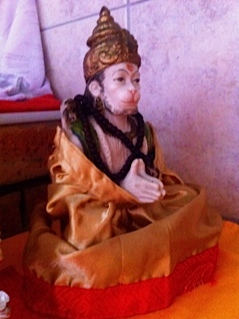 But then again Sri Hanuman’s Powers where fully awakened, only by the one pointed devotion of Sri Hanuman On Sri Ram. But if there is anything I have learned, is that any action done as an offering to the Lord is sure to bear fruit, if done selflessly. Without your guidance Swamiji, we forget our true purpose on this earth plane, please forever keep your hand on our heads. Please accept my sastanger pronam. Next week (10 April onwards) is a very auspicious week. First Basanti Puja, then Annapurna Puja, RamNavami, Neel Puja, Charak Puja, Bengali New year etc. Please accept my sastanger pronam for each day. I read your blog “Selfless action and Siddhis” without any break. All your blogs start with very simple thing but end up with profound messages which linger on for a long time. It is very interesting to read about Jwalamukhi temple which is having full of spiritual vibrations. Sashtang pranam to your lotus feet! By only Divine Mother’s infinite grace, I could see this wonderful blog which is full of rich spiritual messages. Selfless action and siddhis article is so very fantastic and immediately gave me guidance in my life. I am a house wife with 2 sons 15 and 9 years old living with old in-laws in Chennai. Myself and my husband and my children all are ardent devotees of Sri Sri Ramakrishna Paramahamsa deva and divya janani. I humbly bow to your lotus feet and pray thy blessings for my sadhana. Please bless me that I will get my istha daivam sakshatkaram. Your all articles are very highly motivating. Thank you in zillions for guiding all of us with your selfless love. 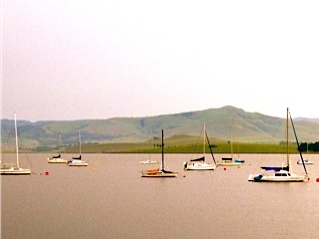 Thank you for visiting the blog, taking interest in reading the Posts and also penning your thoughts. Its a great pleasant feeling when we see devotees of the Master like you frequent this site. To guide others is a very difficult task. It is only by the sheer grace of Thakur that this mind is able to discriminate. 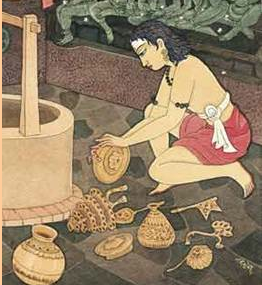 Sri Ramakrishna Himself does His own work, we are only instruments in His hands. Whenever any good work is done in the spirit of seva to Sri Ramakrishna, His power and divine light will be guiding force within us. Be mindful of your obligations and responsibilities to your husband, children and the aged in-laws. That little circle of your family should not be viewed as burden and instead taken as an opportunity to practice nishkaama karma yoga. As Tiruvalluvar says if such a household lady commands the clouds to rain it shall rain…”daivam thozhaal kozhunan thozhudhezhuvaal peiyena peiyum mazhai”. It verily shows that siddhis automatically appear as if from nowhere! Time is no constraint in having saakshaatkaaram (direct perception) of your ishta-daivam (chosen deity) when His grace opens up. All that He requires from us is an undivided attention from us and carry our duties as per our station in life as seva to Him and not expecting any result of our work. May Thakur, Ma, Swamijee continue to bless you and your family. Hope you attend our Chennai Math regularly. My love and best wishes to all of you there! My humblest pranam to your lotus feet. Your words “That little circle of your family should not be viewed as burden and instead taken as an opportunity to practice nishkaama karma yoga.” are like golden words to me. Definitely I will try to follow whatever you asked me to do. Sometimes, I am falling prey to my own negative thoughts which I can only get through, by your divine blessings. Sri Ramakrishna paramahamsa deva is talking to me through you. I am indeed blessed today. My heartfelt thanks to you. I humbly request you to please consider me in your prayers to Thakurji and Sri Ma and my dearest Swamyji. In Ashtothara shatha Namavali of Sri Sarada Devi, the 5th line says “Om Karmathithaye Namaha” – We bow to you, O Sarada, Who is beyond bonds of karma. Sri Krishna says in the Bhagavad Gita – Consider me. I am not bound by any sort of duty. There is nothing in all the three worlds which I do not already possess, nothing I have yet to acquire. But I go on working, nevertheless, if I did not continue to work untiringly as I do, mankind would still follow Me, no matter where I lead them. Suppose I were to stop? They would all be lost – Can one think of giving a better example of this untiring selfless service than our Holy Mother? It was wonderful to read your article on selfless service. Trust that you all are keeping well in Botswana. Yes, Holy Mother’s selfless service to everyone irrespective of caste, colour, creed is incredible! 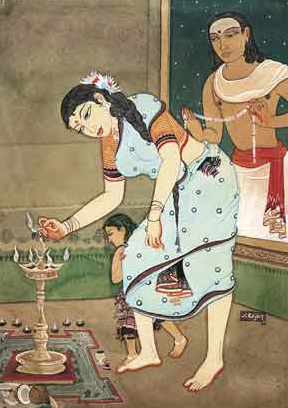 Did you notice an internet site called saradadevi.info ? It contains the full version of major three books on Holy Mother.